Credit: Graham S. Jones, Columbus Zoo and Aquarium. The world's oldest known gorilla has died peacefully in her sleep, just a month after celebrating her 60th birthday. At her death, Colo, the first gorilla to be born in captivity, had outlived the average gorilla by 20 to 30 years, according to her keepers. 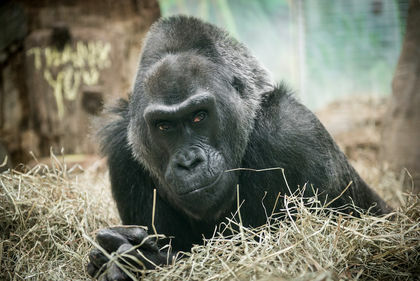 In her long time on Earth, Colo became the matriarch of a huge gorilla family, having lived to see the birth of three children, 16 grandchildren, 12 great-grandchildren and three great-great-grandchildren, according to the Columbus Zoo and Aquarium, where she lived. On Dec. 19, thousands of people, both at the zoo and online, celebrated the beginning of her seventh decade with a big party, complete with a decorated enclosure, special presents and a custom, gorilla-friendly cake. Colo was born at the Columbus Zoo on Dec. 22, 1956, at a time when little was known about keeping and raising western lowland gorillas in captivity, according to a statement from the zoo. She was born a preemie, and a zookeeper found her still in her amniotic sac in a zoo enclosure, after having been abandoned by her mother, according to a 2009 video about her by Columbus Zoo Media. Thanks to 24/7 attention by her human caregivers, she survived and thrived. Colo was briefly called "Cuddles," but after a naming contest, was given her current moniker — a combination of "Columbus" and "Ohio." In 1958, she met a male gorilla named Bongo, who became her mate. The duo's "love affair" outlasted many human marriages, continuing for 25 years. Though Colo spent her life near other gorillas, as she aged, she seemed to do better with more personal space, and so she was moved to a private enclosure. She was also plagued by arthritis in her later years, Audra Meinelt, the assistant curator of the Congo Expedition at the Columbus Zoo, previously told Live Science. In addition to dietary supplements to prevent joint stiffness, Colo was also given a kind of gorilla physical therapy to encourage her to stay active. "Her arthritis is very specific to her hands and feet, so we came up with ways to get her to use her fingers more often," Meinelt said. "We also changed the way that we present her diet, so that also causes her to exercise her fingers," she said. Colo also became choosier about her food, shunning green beans, grapes, zucchini, honeydew, oranges, cantaloupe and strawberries as she got older, Dana Hatcher, manager of animal nutrition at the Columbus Zoo, previously told Live Science. To make sure that she got ample nutrition, her caregivers also gave Colo probiotics, brewer's yeast for B vitamins and iceberg lettuce for its water content.